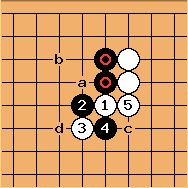 This proverb says that in a position like the one in this diagram, playing hane with Black a or White b (facing the center) is a very big move. If one is faced with a position like this, it is hardly ever good to play somewhere else on the board. The difference between these two moves is simply too large. Black is pushed down with limited expansion? opportunities. Black has a cutting point at a and the chain has only three liberties. This induces weaknesses around b (see eye-stealing tesuji), which is a burden to Black. In some circumstances, may choose to simply pull back at . But similar observations apply. Enfors: More newbie questions: Wouldn't c be better than , to create two Tiger mouths, which would also protect the cutting point above c? Dieter: whether a solid connection is better than a trumpet connection is a debate which is governed by the local, and most often even global situation. Basically, the trumpet connection is, as you say, locally connecting all stones, while the solid connection here will leave the other cutting point depend on a ladder. The drawback of a trumpet connection is that there are two peeping forcing moves available for the opponent, which potentially turn the whole construction into a dango. There is some talk about this debate at the trumpet connection page, but I believe it is worthy of a page of its own. I'll leave this here for some time, then move it. Enfors: Ah yes. I see now. At the time, I didn't notice that the cutting point left above c is ladderable. tapir: Another issue for the trumpet connection is what happens after Black d. With a solid connection White most of the time will play hane, with a trumpet connection Black can cut in sente. martin: Can black cut at instead of extending at ? hyperpape: As always, it depends on circumstances, but Black has the isolated stone and the cutting point at a after cutting and connecting. Unless getting the atari at d is necessary and valuable for Black, this will usually result in a local loss. Author: AndreEngels, (WikiMasterEdit by Dieter).